Singapore’s sovereign wealth fund GIC announced today that former President Tony Tan has been appointed director and special advisor of the organisation. Besides having been the 7th President of Singapore, the ex-PAP politician has helmed the Ministries of Education, Trade & Industry, Finance, Defence and Health during his tenure as elected Member of Parliament. He was also served as Deputy Prime Minister for a decade, between 1995 and 2005. After his retirement from Cabinet in 2005, Dr Tan served as deputy chairman and executive director of GIC (previously known as Government of Singapore Investment Corporation) from Sept 2005 to June 2011. "Singapore has benefitted greatly from your calm and dignified presence, wealth of knowledge, and steady judgment": PM Lee pays tribute to Dr Tan. He was a President who “worked tirelessly” to fulfil his responsibilities – bringing Singaporeans closer together, being the custodian of Singapore’s reserves, upholding the integrity of the public service & enhancing relations with other countries. That was how Prime Minister Lee Hsien Loong summed up Dr Tony Tan Keng Yam’s term as Singapore’s 7th President, which ended on Thursday (Aug 31). 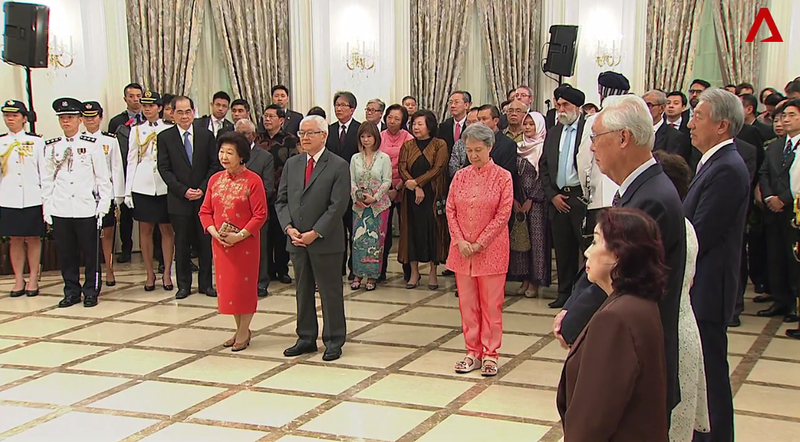 Speaking at a farewell reception, PM Lee recalled how Dr Tan took office after a “hard-fought” election. In his 6 years as president, Dr Tony Tan Keng Yam was a "prudent and conscientious custodian" who made sure Singapore's past reserves were well guarded & its key public offices held by suitable, qualified people. This was helped by the warm ties between the head of state and the Government, said Prime Minister Lee Hsien Loong last night. 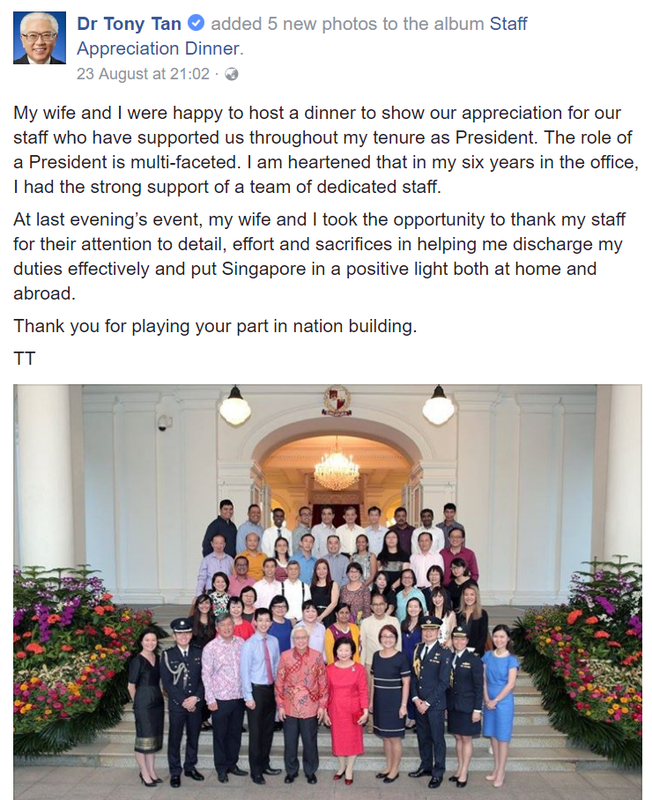 "We were able to operate these presidential safeguards effectively & smoothly, because your office and the Government have had a close and constructive working relationship, based on mutual trust and respect," he said at a farewell reception for Dr Tan at the Istana. 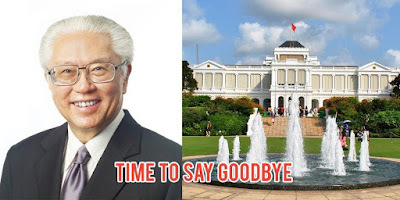 President Tony Tan Keng Yam leaves office this Thursday as the head of state who preceded the biggest change to the elected presidency in its 26 years. The move to entrench multiracialism in the highest office in the land, by ensuring members of the country's main races occupy it periodically, is a change he fully supports. He believes it will stand the nation in good stead and further fortify the social fabric at a time when the terror threat to Singapore is at its highest. My wife and I were happy to host a dinner to show our appreciation for our staff who have supported us throughout my tenure as President. The role of a President is multi-faceted. I am heartened that in my six years in the office, I had the strong support of a team of dedicated staff. At last evening’s event, my wife and I took the opportunity to thank my staff for their attention to detail, effort and sacrifices in helping me discharge my duties effectively and put Singapore in a positive light both at home and abroad. Thank you for playing your part in nation building. A Straits Times video featuring an interview with President Tony Tan to mark the end of his presidency has gone viral, but for the wrong reasons. According to the video, President Tan listed Joseph Schooling's Olympic Gold Medal as one of the highlights of his presidential term. However, this prompted netizens to flame him for trying to connect Schooling's gold medal with himself. It had been reported that Schooling's gold medal had little to do with the support of Singapore Sports bodies and more to do with Schooling's unyielding determination to train and best himself. The Straits Times has been doing a few articles chronicling the presidency of Dr Tony Tan. 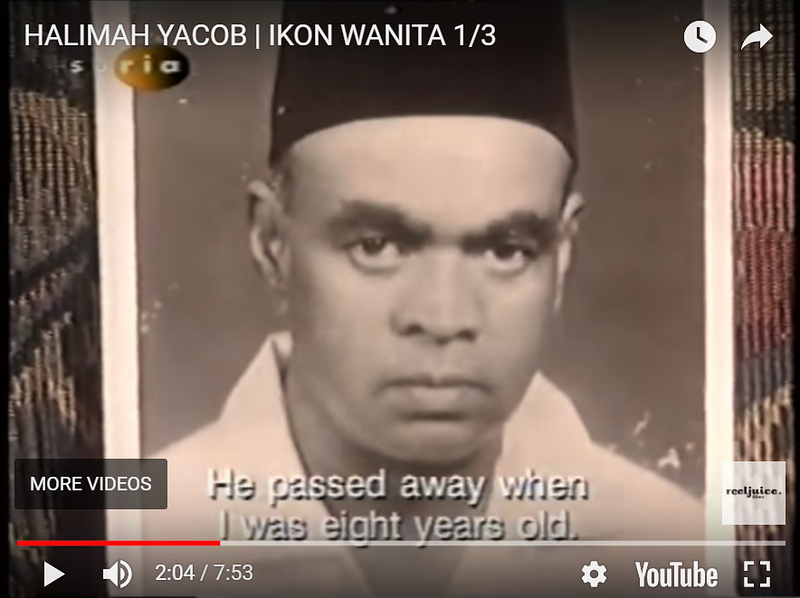 One of their videos on this series was captioned, “Witnessing Singapore’s first Olympic gold win was one of the highlights of my presidency,” in which President Tony Tan reflected on his six years at the Istana. Some netizens comments on the Facebook post of the video were nothing short of hilarious. The following are the comments with the most number of likes in that post. 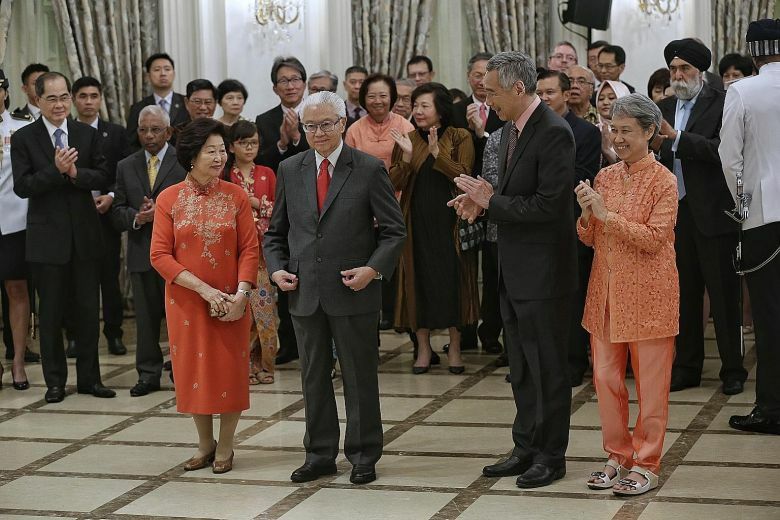 What exactly has President Tony Tan done during his tenure? 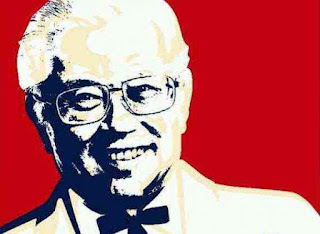 Did ST just report that President Tony Tan invites the Thai King to Singapore to eat KFC? 5 in Thai is "Ha" and in Malay is "Lima"
Hence "5 5 5" in Thai is "Ha Ha Ha"
related: "An Indian Muslim can be a Malay but a Malay Christian cannot be a Malay"
PE2017: Mr Owl for President? Presidential Election 2017: What makes a person Malay? If you’ve been following Prime Minister Lee Hsien Loong’s Facebook page long enough, you will have heard about the biennial barn owl who visits the Istana. Indeed, the diplomatic visitor first showed up inside PM Lee’s office in November 2013. And returned again, promptly, two years later, in the height of the haze. And now it’s back again, inviting itself into the Istana’s highly secured grounds without giving a hoot. It has decided it’s had enough of this presidential election nonsense and is volunteering itself for the role. Someone at the Istana will be enrolled to Hogwarts for further studies. Quite an easy one, if you’ve been a long-time follower of my Facebook Page! The Istana appears to be a regular stopover for owls, with latest one dropping by after visits in 2015 and 2013. (It is rather curious why they only visit every two years!). 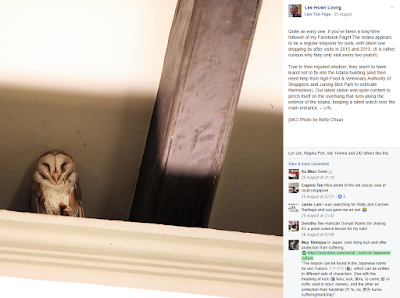 Jasmine P'ng Siok Lee Owl visit again? same bird from 2013 and 2015? What significant events happened during last 2 visit? Bird want to bring you a message? This year important event is President Election, restricted for Malay candidates only! Expect any issues or turmoil politically? 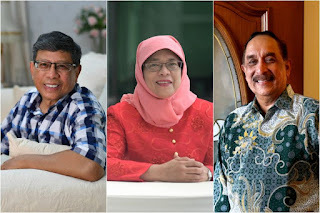 Online debate hot up, much misgivings about timing of this special President election, government real intention or agenda to host this special President election this year. Government need to consider better way to engage citizens to have candid discussion on such sensitive political issues. Election during an Internet age can be difficult especially how to counteract fake news and unsubstantiated conspiracy theories. Concerned. 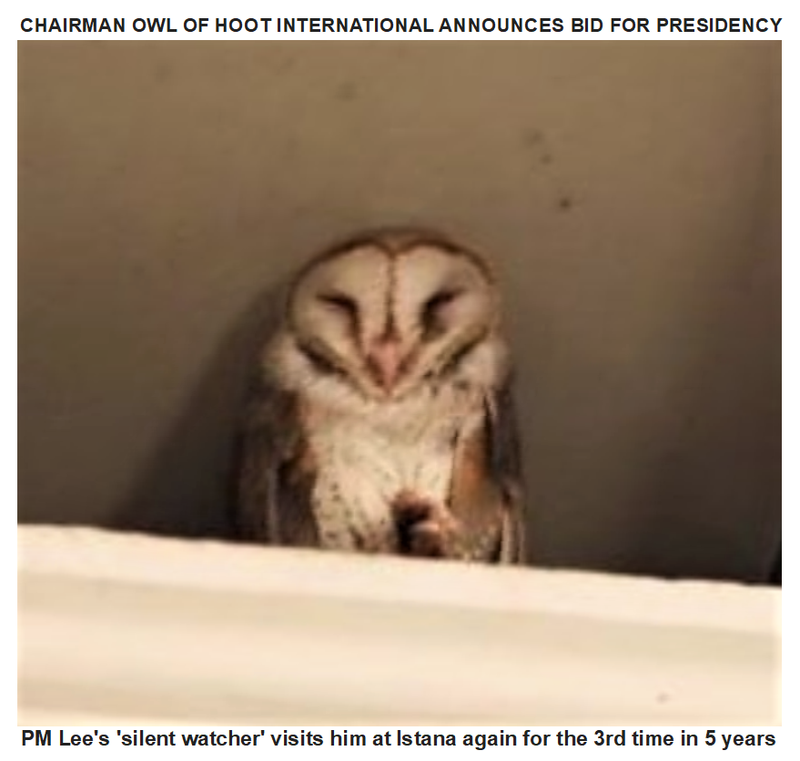 Prime Minister Lee Hsien Loong has been visited by a barn owl at the Istana for the 3rd time. He posted a photo on Facebook that showed the cute creature nestling in the overhang along the Istana's exterior and wrote: "#guesswhoo's back?" A barn owl had also made previous appearances at the Istana, in PM Lee's Sri Temasek, in 2013 & 2015, and it is possible that this one is the same bird. Native American tribes (primarily plains’ Indians) viewed the owl as a protector against harm and their feathers were ritually worn to ward of evil spirits. Ancient Athenians made the owl an emblem of wisdomand even emblazoned the image of the owl on their coinage. To the ancient Greeks, the owl is a symbol of Athene who is goddess of foresight & knowledge. Taking symbolism from the owl directly, it is noteworthy that it is a creature of the night. Nocturnal creatures are symbolic of inner-knowing, psychic ability, and intuition – so too is the owl. If an owl has visited you, an incredible gift has been bestowed. Also, keep in mind that animals are only called to those who share the same energy. In other words, you hold within you some of the very same symbolic attributes the owl represents. Somewhere out there in south-eastern Kazakhstan, there’s a mountain named after a Singaporean — the first of its kind. And not just any Singaporean, but Singapore’s first elected president, Ong Teng Cheong himself. 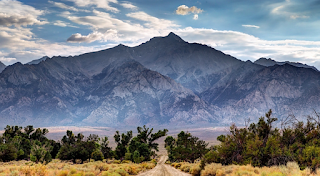 The 4,743m-tall mountain sits in the middle of a remote Tien Shan range that stretches along the border between Kazakhstan, Kyrgyzstan and China, reported The Straits Times. Ong Teng Cheong peak — so named because it was first conquered by a Singapore team on July 29, 2005 — was formally recognized on June 28 this year by the Mountaineering and Sport Climbing Federation of Kazakhstan. Mountaineers David Lim, Wilfred Tok, Mohd Rozani Maarof and Shani Tan were the first ones to ascend the mountain, and they named it after Ong, who was the patron of Singapore’s first Everest expedition in 1995 during his presidency. Mdm Halimah Yacob unveiled her campaign slogan at the NTUC Centre on Tuesday (29 August) and introduced the members of her campaign team. The former Speaker of Parliament and People's Action Party Member of Parliament announced that her campaign slogan is “Do Good, Do Together”. She said, "It allows us together as one people to come together and do what is good for the community and the country – I think that is the most important part of it," and added, "We 'do good, do together' regardless of race, language or religion, and we come together to make Singapore a home we can all be proud of." Mr Farid, 62, is one of the three people known to have submitted applications to contest the Presidential Election, which is the first to be reserved for Malay candidates. Mr Salleh Marican founded Second Chance Properties Ltd and has been Chairman and CEO since its incorporation. He has 35 years of retail experience and a recipient of the 1996 Entrepreneurship Excellence Award of the Nanyang Technological University. 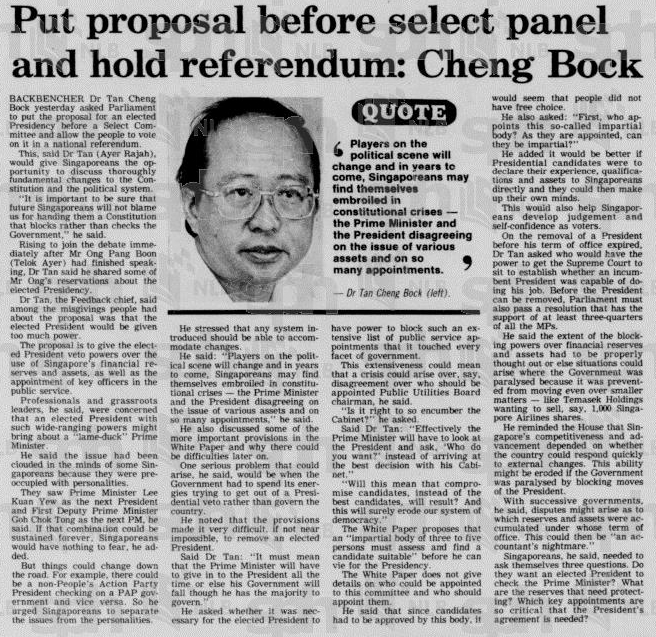 In the 1980s when the Government released its first White Paper on Elected Presidency, the people really thought that Lee Kuan Yew would become Singapore’s first Elected President. Dr Tan Cheng Bock who was then the chief of Government’s feedback channel confirmed this in Parliament during the debate of the Bill. “They see Mr Lee Kuan Yew as the next President and Mr Goh Chok Tong as the next Prime Minister and ask, is not everything the same except in name?” – Dr Tan Cheng Bock in Parliament. 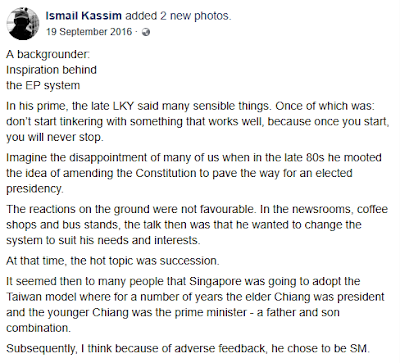 Now, a former Senior Political Correspondent at Straits Times, Ismail Kassim, in a Facebook note has suggested that Dr Tan’s feedback was accurate. “At that time (late 1980s), the hot topic was succession.,” he wrote. At that time, the hot topic was succession. It seemed then to many people that Singapore was going to adopt the Taiwan model where for a number of years the elder Chiang was president and the younger Chiang was the prime minister - a father and son combination. Subsequently, I think because of adverse feedback, he chose to be SM. Prime Minister Lee Hsien Loong has issued the Writ of Election for the Presidential Election, naming Sep 13 as Nomination Day. If we’re lucky to have more than one person who qualifies to run for the position of Singapore’s president, the polling day will be held 10 days later, on Sep 23. As reported, debated and written about in various think pieces, the upcoming presidential election will only be reserved for Malay candidates, due to the implementation of a “hiatus-triggered” model, said to ensure multiracial representation in the highest office in the land. According to a press release by the Elections Department, the nomination place will be the auditorium of the People’s Association along King George’s Avenue. Currently, there are only three big contenders who’ve publicly indicated that they’ll be running for president. There’s Bourbon Offshore Asia Pacific chairman Farid Khan. There’s Second Chance Properties founder and CEO Mohamed Salleh Marican. And, of course, there’s (former) People’s Action Party stalwart Halimah Yacob, who recently stepped down from her roles as Speaker of Parliament and a Member of Parliament for the Marsiling-Yew Tee GRC. I have issued the Writ of Election for the Presidential Election. Nomination Day will be on 13 September. We are a multiracial country, and every citizen should know that someone of his community can become President, and does become President from time to time, and thus represent all Singaporeans. Singaporeans will vote for their 8th President on September 23, if more than one person qualifies to run for the position. 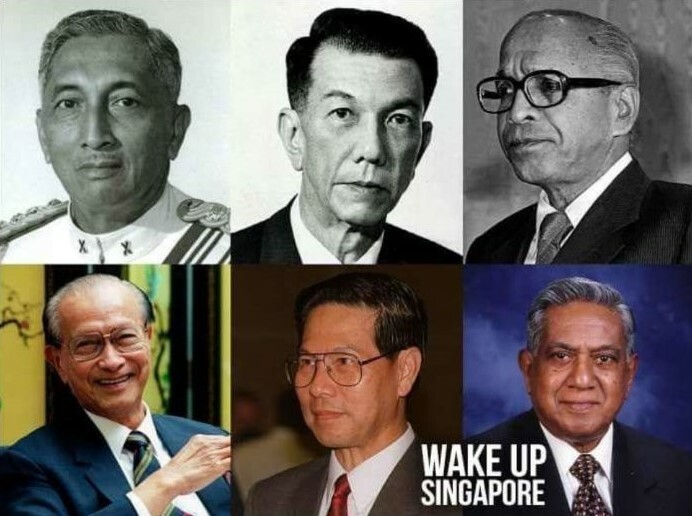 The winner will be the 2nd Malay president in Singapore's history, and the 1st to be chosen in a presidential election reserved for candidates of a specific community. Singaporeans will know if they will get to cast their vote or if the election will be a walkover, on Nomination Day, which will be on September 13. PRIME Minister Lee Hsien Loong has issued the writ of election for next month's Presidential Election, with Nomination Day set for Wednesday, Sept 13. The nomination centre is the auditorium of the People's Association headquarters along King George's Avenue. 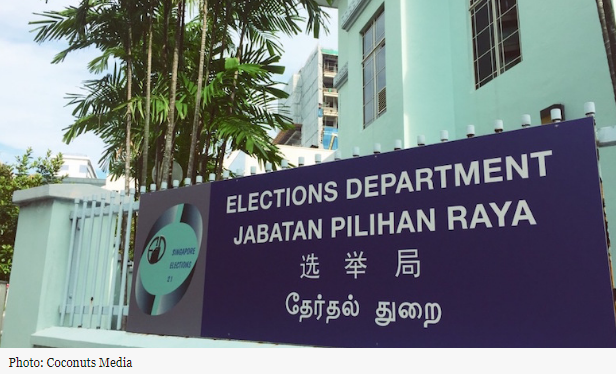 If there are at least two nominated candidates for this election that's reserved for those from the Malay community, the Returning Officer Ng Wai Choong will declare Saturday, Sept 23 as Polling Day. Applications for the Certificate of Eligibility and the Community Certificate must reach the Elections Department (ELD) by 5pm on Sept 4. The Workers’ Party had intended to raise the “counting of presidents” issue in parliament on Monday (11 Sept). 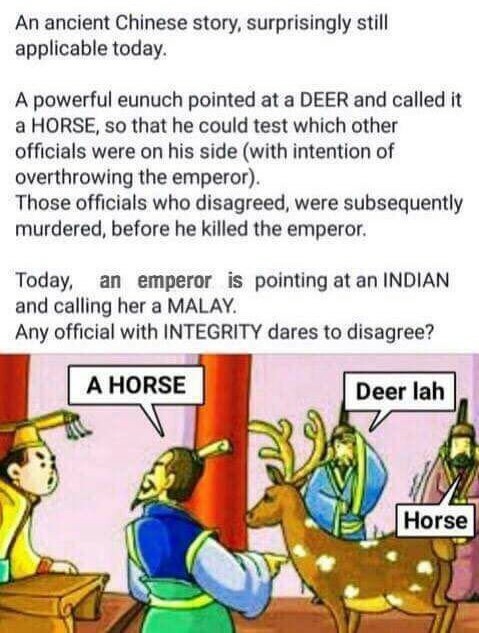 This would have been a relevant discussion, considering that Singapore is set for Nomination Day on 13 Sept and Singaporeans will elect their next President on 23 Sept. However, parliamentarians chose to scupper debate on the validity of the PE2017 reserved election, in favour of discussing namely “Community Sentencing and Other Rehabilitative Options”. Those keeping track of the political scene in Singapore are surely to have noticed yesterday (5 Sept) the unexpected announcement of the next Speaker of Parliament by our Prime Minister. 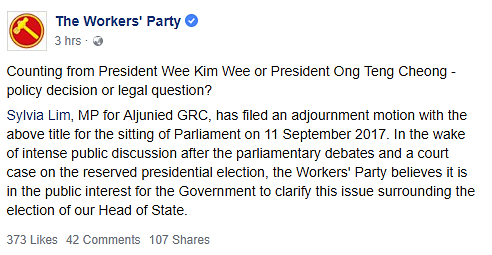 Amidst fallout of the news, you might have missed out on equally-as-important information provided by The Workers’ Party (WP) on their Facebook page just an hour later. WP Chairman Sylvia Lim’s proposal to discuss the controversy regarding the recognition of Singapore’s first Elected President was not chosen for the 11 Sept Parliament sitting. 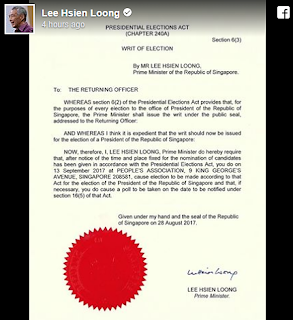 Titled “Counting from President Wee Kim Wee or President Ong Teng Cheong for Reserved Presidential Election – Policy Decision or Legal Question“, the adjournment motion was supposed to be the final debate on the reserved presidential election. The Workers’ Party has filed an adjournment motion on the upcoming reserved Presidential Election (PE) for the next sitting of Parliament on 11 September. 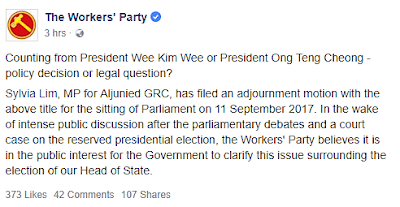 In a Facebook post titled “Counting from President Wee Kim Wee or President Ong Teng Cheong – policy decision or legal question?” on Monday (28 August), the opposition party said that Aljunied GRC MP Sylvia Lim had filed an adjournment motion with the above title. “In the wake of intense public discussion after the parliamentary debates and a court case on the reserved presidential election, the Workers’ Party believes it is in the public interest for the Government to clarify this issue surrounding the election of our Head of State,” the post added. Counting from President Wee Kim Wee or President Ong Teng Cheong - policy decision or legal question? Sylvia Lim, MP for Aljunied GRC, has filed an adjournment motion with the above title for the sitting of Parliament on 11 September 2017. In the wake of intense public discussion after the parliamentary debates and a court case on the reserved presidential election, the Workers' Party believes it is in the public interest for the Government to clarify this issue surrounding the election of our Head of State. It is all about one man, Stupid! We heard yesterday from People's Action Party (PAP) Ministers and the Emeritus Senior Minister a full rehash of their tired and by now totally discredited arguments for a reserved Presidential Election. For good measure, terrorism was also thrown in as part of the PAP's staple of fearmongering. Despite all the political sophistry, it is not difficult to penetrate the PAP's fog of propaganda. 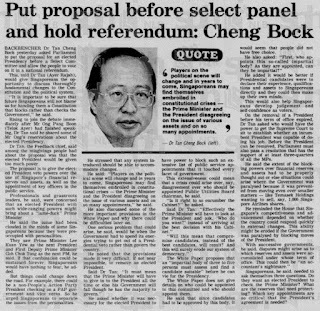 Fair-minded Singaporeans know that this dastardly election is all about denying one man, Dr Tan Cheng Bock, the Presidency. The entire Establishment has connived in this dishonourable venture. History will not be kind to them. This racially divisive election has the same effect as segregating our various races into seperate and isolated settlements. How can the PAP compare it with the Ethnic Integration Policy in Public Housing designed to promote racial integration? Multiracialism and multiculturalism are all about inclusion and not exclusion, which is what the reserved election amounts to. "this reserved election made a large part of the population unhappy as it is against meritocracy." Minister Goh Chok Tong however was quick to soften his tone. ESM Goh Chok Tong added that Singaporeans “should understand why the government is doing this”. Thank you for this opportunity to clear the air. In May 2009, I was approached to be a founding director of Temasek Foundation Cares (TFC), a newly set up foundation to help Singaporeans. They would like me to accept the appointment as I had been active in charitable work. I accepted because it was something I believed in. TFC is a charitable body with IPC status, it is not a political body or in any way related to politics. The board members serve on a voluntary basis. Mr Salleh has submitted his forms required of him to stand nominated for the upcoming Presidential Election but it still remains to be seen if he will be qualified to stand as a candidate by the Presidential Election Committee as he does not automatically qualify under the recently introduced amendments to that of private sector candidates for the Elected Presidency. 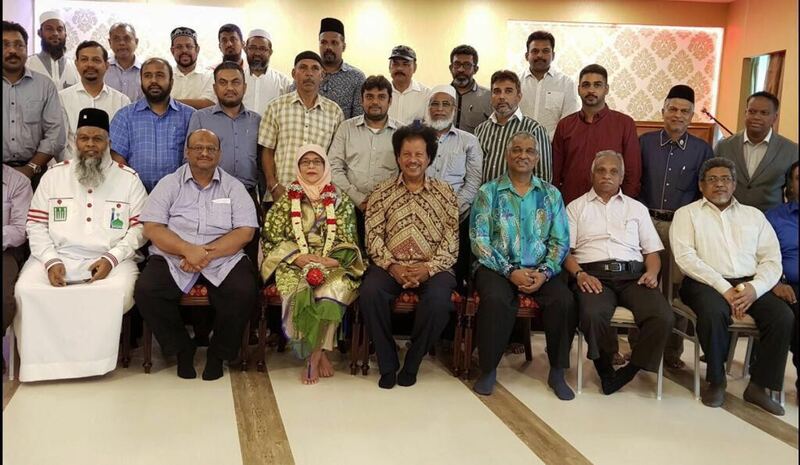 Prominent radio personality Hamish Brown has questioned if Presidential hopeful Halimah Yacob is as indeed independently-minded as she has claimed in a newspaper interview. 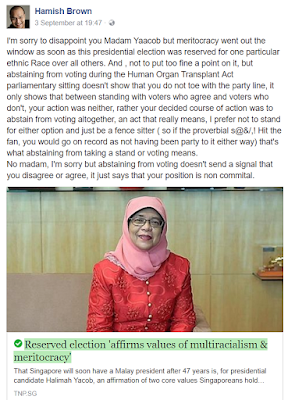 In an interview with The New Paper Madam Halimah illustrated an incident where she abstained from voting on an issue after the Whip was listed, to make a point that she not always followed the directions of her political party elders in the People’s Action Party. Writing in his Facebook Mr Brown said, abstaining from voting doesn’t send a signal that she agrees or disagrees. That Madam Halimah’s decision only showed that her position was a non-committal one. I'm sorry to disappoint you Madam Yaacob but meritocracy went out the window as soon as this presidential election was reserved for one particular ethnic Race over all others. And, not to put too fine a point on it, but abstaining from voting during the Human Organ Transplant Act parliamentary sitting doesn't show that you do not toe with the party line, it only shows that between standing with voters who agree and voters who don't, your action was neither, rather your decided course of action was to abstain from voting altogether, an act that really means, I prefer not to stand for either option and just be a fence sitter (so if the proverbial s@&/,! Hit the fan, you would go on record as not having been party to it either way) that's what abstaining from taking a stand or voting means. 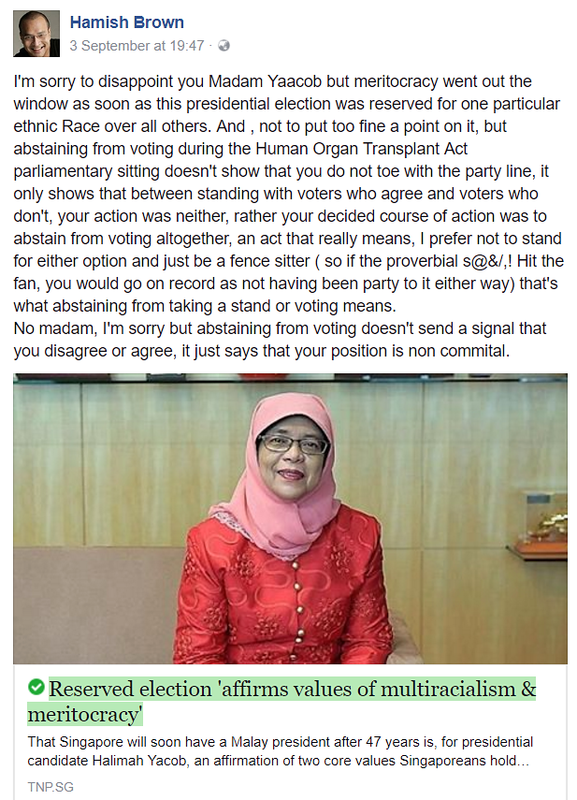 No madam, I'm sorry but abstaining from voting doesn't send a signal that you disagree or agree, it just says that your position is non commital. 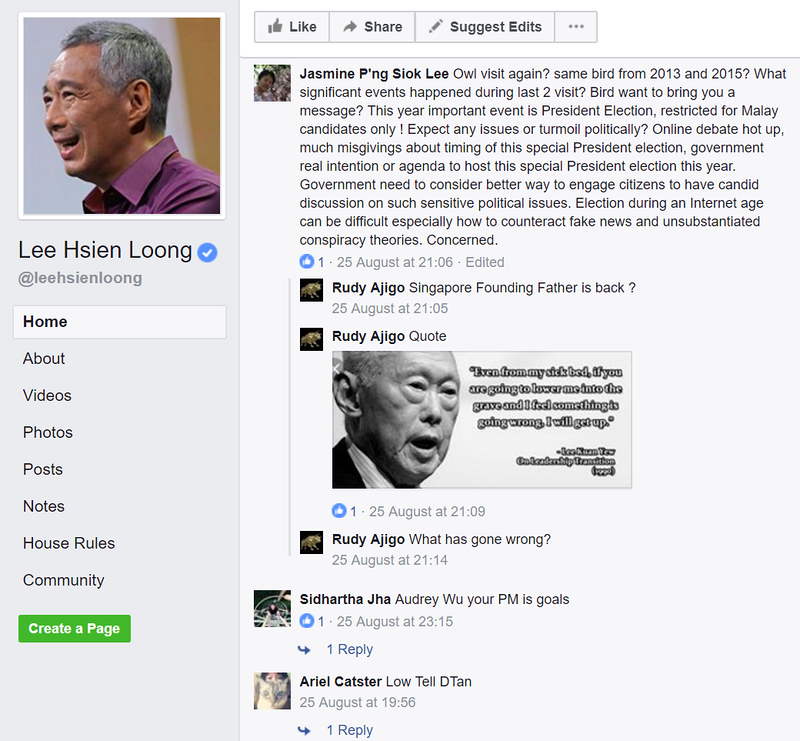 In a Today report dated 15 September 2017, it is reported that despite the fact that it was the week of firsts for Singaporean to have the first reserved election which resulted in the city state's first woman President and the first Malay Head of State in 47 years, criticism of the election process for the Elected Presidency (EP) has persisted online. Speaking at the first Majulah Lecture organised by the Nanyang Technological University on Wednesday (20 Sept), Tharman was quizzed on the 2017 Presidential Election after the lecture, according to media reports. One student asked if the reserved presidential election is an indication that Singapore is “regressing as a society”, despite Singaporeans growing up reciting a pledge with the words “regardless of race, language or religion”. 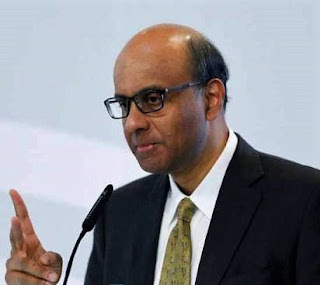 In response, Tharman said while he was “proud” that Halimah Yacob was the first Malay president in 47 years, he told the audience of more than 1,500 it was “understandable” that Singaporeans had questions about the recent election, which was reserved for Malay candidates. It is one of the worst kept secrets this year, where she decided not to say yes until everything has been sorted out (she had to talk to her family, residents, consider her existing duties etc etc). It’s not like she can suka suka drop everything and go for the presidency, and if she loses, it’s not like she can just say “Can put me back as Speaker?” right? 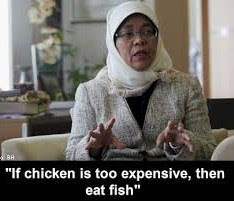 So what other worst-er kept secrets did Halimah Yacob have that maybe you already knew (or can just pretend you did)? Who is a Malay? The debate is still raging in Singapore with many disputing the Malay credentials of the PAP’s Presidential election’s candidate. 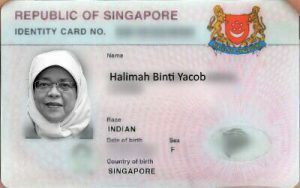 But a doctor’s prescription on who is a Malay in Malaysia could save Halimah Yacob the day in the court of the social-media haranguers. Beg-packing: Is travel a privilege or a right?